Permanent link to this topic. Posted 2014-10-31 15:13:11. Reply to Barbara_Loomis. Categories: Library News. CSU Michael Schwartz Library in collaboration with the CSU Poetry Center and Hydeout Press, will host levyfest at the Michael Schwartz Library on Saturday, October 25, 2014 from 9:30 am to 5:00 pm. levyfest is an annual festival and conference celebrating 1960s Cleveland poet, publisher, and artist d.a. levy (1942 - 1968) and his influence upon small press publishing, print and book arts and the poetry communities of Cleveland, Ohio and beyond. Join us for opportunities to meet with contemporaries of d.a. levy active during the Mimeograph Revolution, learn about print history and the role of the small press in Cleveland and peruse the Michael Schwartz Library's d.a. levy Collection (more about the collection at www.ClevelandMemory.org/levy), and share in the levyfest experience! More levyFest events will be held throughout Cleveland from October 24 to October 26, 2014. Visit levyfest 2014 for details. 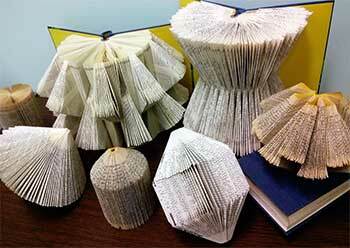 See the Octavofest calendar at Octavofest.org for a complete schedule of book and paper art events in Northeast Ohio. Permanent link to this topic. Posted 2014-10-20 12:22:52. Reply to Barbara_Loomis. Categories: Library News. Permanent link to this topic. 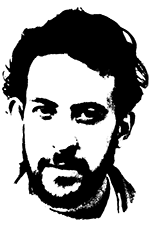 Posted 2014-10-14 09:07:54. Reply to Lauren_Felder. Categories: Library News. The library presents a satellite display of the CSU Galleries exhibit titled At Home in Africa: At Home in Africa: Design, Beauty and Pleasing Irregularity in Domestic Settings,which features the inspirational and creative design, pattern and form found in a wide variety of traditional handcrafted objects from African homes of the past 130 years, covering over 70 ethnic groups from 30 countries, which recently closed on Oct. 4. 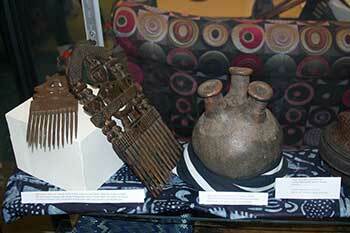 A sampling of these objects, including an Akan courtship comb, an East African beer drinking container and a Toma stool are on display in the library. Permanent link to this topic. Posted 2014-10-10 17:10:24. Reply to Barbara_Loomis. Categories: Library News. 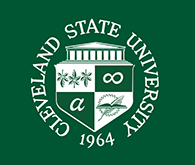 Now through December 16, Cleveland State University Michael Schwartz Library hosts the Science On a Sphere exhibit presented by NASA Glenn Research Center and sponsored by NASA's Space Communications and Navigation (SCaN) Program. 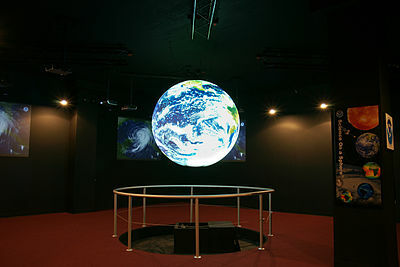 Science On a Sphere is a mesmerizing visualization system developed by the National Oceanic and Atmospheric Administration (NOAA) that uses computers and video projectors to display animated data on the outside of a suspended, 6-foot diameter, white sphere. The result is a unique and intuitive educational platform that can show real-time weather, planets, moons, tsunamis, climate models, and is only limited by the imagination. The Science On a Sphere exhibit has sparked the interest of several Washkewicz College of Engineering Senior Design Project students. They plan to create new material to display on the sphere that effectively communicates technical information to a broad audience. Students and faculty are encouraged to visit the exhibit and see how it can be incorporated into their curriculum. Jeff Woytach from NASA Glenn will discuss the Solar System. Jeff Stevenson, Public Programs Coordinator, Imagination Station in Toledo, Ohio. Presentation title: "Dynamic Earth" - The earth below our feet has always been a constant in our lives. However, our planet has been changing and evolving long before we arrived and will continue to do so for millions of years after. Dr. Woodrow Whitlow Jr., Executive in Residence at the Washkewicz College of Engineering, former Associate Administrator for mission support at NASA headquarters in Washington, D.C., and former Director of NASA Glenn Research Center in Cleveland. Dr. Whitlow will discuss highlights of his 34 year career with NASA. Permanent link to this topic. Posted 2014-10-07 13:11:22. Reply to Lauren_Felder. Categories: Library News, Science and Technology. Showing posts from October 2014 only. Display other dates.